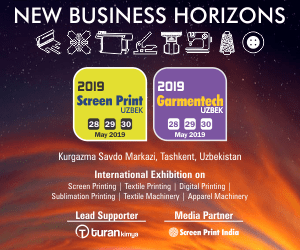 Vibgyor Exposition, a part of the Aditya Group, India, will be organising Screen Print Uzbek 2019 exhibition and the concurrent event, Garmentech Uzbek 2019 expo. These exhibitions will be held on 28, 29, 30 May 2019 at Kurgazma Savdo Markazi in Tashkent, Republic of Uzbekistan, an unexplored market strategically located in the West Central Asia. The new exhibition will focus on Screen Printing, Textile Printing, Digital Printing, Sublimation Printing, Textile and Apparel Machinery. Besides Indian manufacturers and suppliers, many international manufacturers and suppliers are also taking keen interest to showcase their range of products and services in this exhibition. And the organisers are making all efforts to make this event a grand success. The organizers have begun massive online/offline promotion/social media campaigns in Uzbekistan and neibhouring countries. “Print service providers and print buyers in Uzbekistan and neighbouring countries will have a great opportunity to explore products and services in the field of Textile, Digital, Sublimation Printing & graphics/signage printing and also garment and apparel machinery. And at the same time the exhibitors will have the opportunity to explore potentials in a new emerging market,” he concludes.